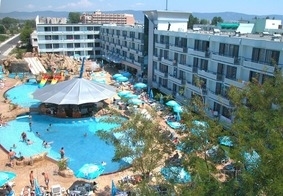 Kotva Hotel in Sunny Beach resort in Bulgaria. Online bookings. Great rates. - 10% discount until 20 May 2018. Location:Kotva Hotel is located 150 metres from the beach in Sunny Beach Resort. Accommodation: Kotva Hotel offers single and double rooms, as well as apartments. All of them are equipped with SAT TV, in-room telephone, mini-bar, balcony and bathrooms with bathtubs. Hotel Facilities: Restaurant, open-air swimming pool, fitness and massage center, sauna and Jacuzzi, hairdressers' studio. Animation programmes, playground and children's swimming pool for the kids.